When a developer chooses aluminum formwork technology by MiVAN for the superior finish you know he is serious about quality. Founded by the Mr. V.B. Paranjape in 1930 in Mumbai, the Paranjpee Schemes has built over 20,000 homes built across western Maharashtra, over 170 top-of-the-line projects completed in the past 20 years.Blue Ridge is yet another attempt by the developer to further strengthen his hold on the Pune market. Located in Hinjewadi, the IT Hub of Pune Blue Ridge is a project where you get exclusive amenities which meet the aspirational segments mindsets. Strategically located in Hinjewadi, the IT hub of Pune Blue Ridge consists of a Special Economic Zone (SEZ) and residential luxury that is pretty different from the rest of the Pune development. The Blue Ridge SEZ will cater to the new age IT/ITES industries and offer work and leisure facilities that are unheard of. Let's just say, you can walk down to the golf drive each time you want to unwind! With high rise apartments, luxury villas, service apartments, a sports zone, boat club, butterfly garden and a host of equally impressive amenities. Let's look at how the developer has been living up to his promise of delivering this beautiful dream. The amenities are unparalleled at Blue Ridge. Let's just list down all the amenities for your convenience. Well on paper - Life is complete here! Connectivity is an issue, you are expected to have your own vehicle for all basic needs. In fact, with a walkscore of 32 is one of the lowest ever we have come across. 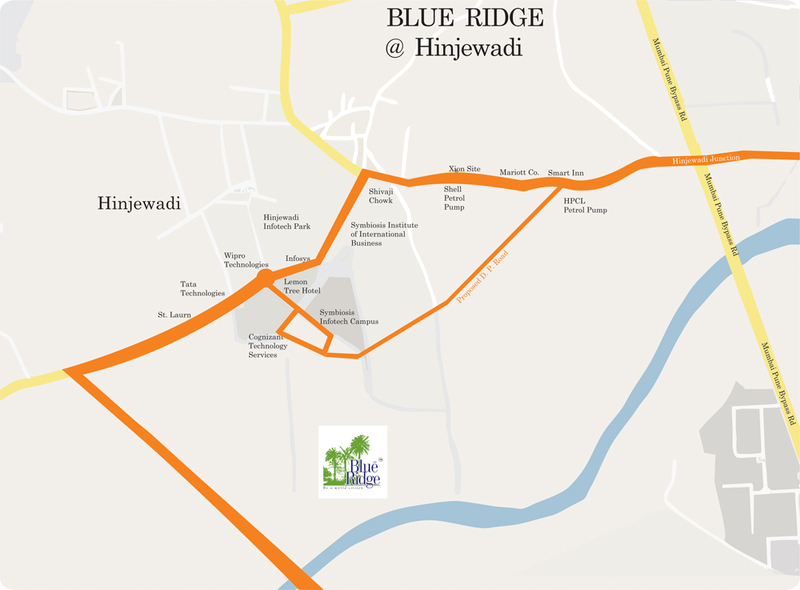 There is a proposed road from BlueRidge site to the main Hinjewadi road 5 minutes however it might take time. Again there is a proposed road to Baner (6 lanes super highway) but it's in the pipeline. If you work in Hinjewadi it’s a cake walks its pretty close you might considering walking/ cycling to work. This is by far one of Pune's green zones. The area is still under development with new schools, hospitals, malls coming up. 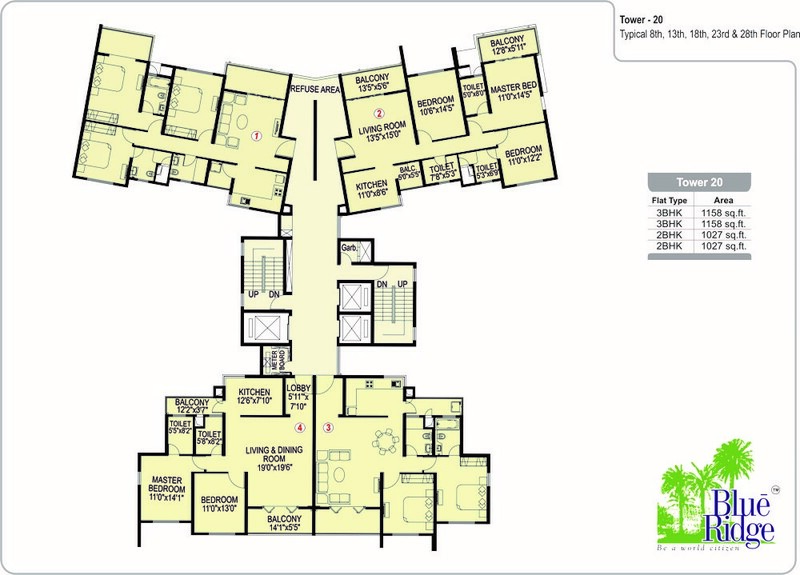 The master plan is well laid out, open views and enough privacy is guaranteed in this project for sure. A golf course in the middle of the project, well what else can you ask for. People say FSI of this golf club was used to stack too many floors in the towers but its OK as long as the residents can use this space. Also for anyone buying an apartment the view is excellent from their apartments. Unobstructed views. Coming to the product. It's indeed a township which is well laid out & future ready. The amenities are unparalleled at Blue Ridge. 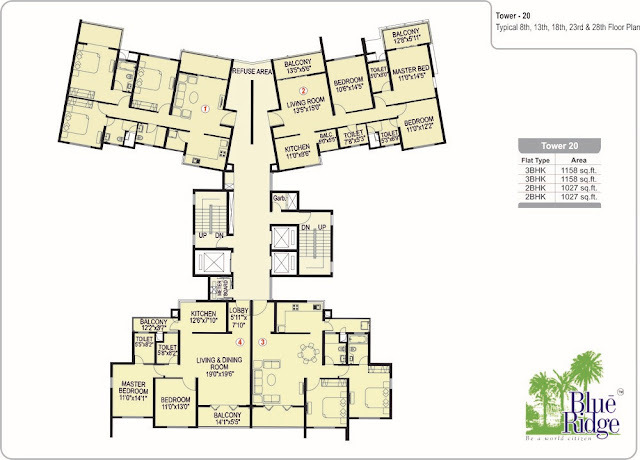 There are multiple floor plan we have randomly picked the 2 BHK plan in Tower 20 and will analyse the same. An entrance lobby leads you into a roomy (almost 400 sqft.) living dining space which further extends out to the deck area. The rooms are decent sized with the master bedroom and guest bedroom having living space of more than 140 sqft each. The apartments are lavish in nature but they could have been more luxurious if there was a small pooja room and a wardrobe niche planned. Nevertheless, the layout is a winner for us. It feels like a vacation home in the city, go for it.